OK, we have talked a lot about Bangkok so far. Now it’s time to get into some details and put up with some travel tips. Hope it will be helpful! 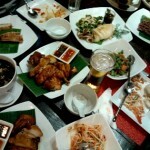 You know we stayed in Bangkok for 4 days in total (2 days with my mom and 2 days with our friends). Infrastructurewise, the public transit in Bangkok is impressively well planned and developed. It was the most useful method for us to get around in the city. If you are a budget traveler like us, using the public transit in Bangkok will make your in-city transportation very easy and fast! Let’s start from here. 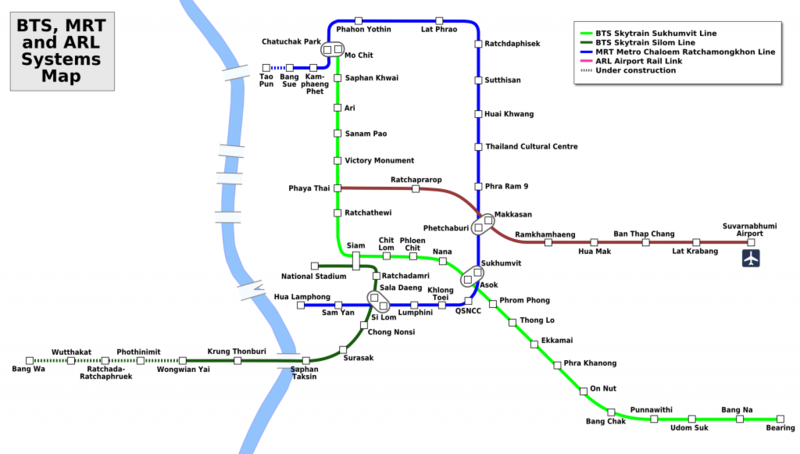 Bangkok public transit is composed of 3 parts – BTS Skytrain, Metro and Airport Rail Link. They are marked in different colors respectively in below map. 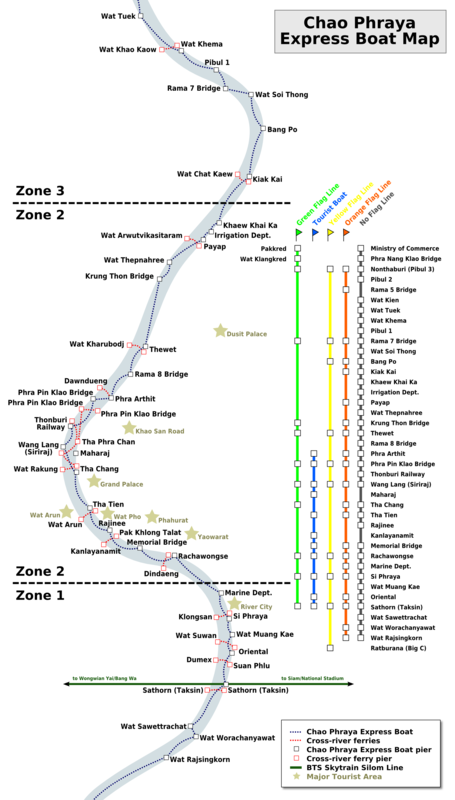 Put into operation on December 5th, 1999, BTS Skytrain has 2 routes. One is Sukhumvit Line, the light green line going from the north to the south-eastern of central Bangkok. The other one is Silom Line, the dark green line running to Saphan Taksin Station where the central pier Sathorn is. The two BTS lines intersect at Siam BTS station. The BTS Skytrain and the MRT underground intersect at Asok. The Skytrain usually runs until midnight every day. Each station has a notice with a first and last train time for each direction. So pay attention if your schedule is time sensitive. I would recommend to download this map on your smart phone in advance so that you will have a clear idea of which line to take or switch and which station to get off before you go somewhere. 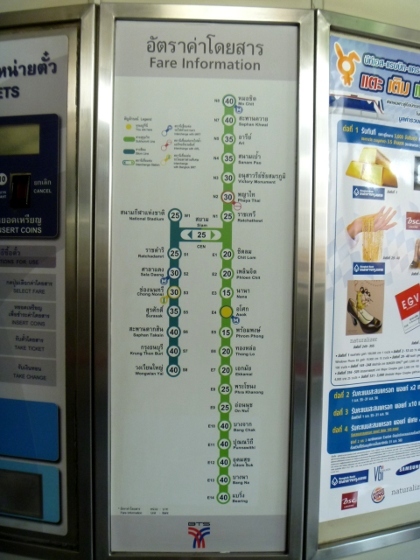 Also the hard copy of public transit maps can be reached freely from a lot of places in Bangkok, such as the airport, hotels and travel agent offices, etc. How to pay for BTS Skytrain tickets? Paying for the Skytrain tickets is actually very different from other cities where public transit system is also well developed, such as Taiwan, Hong Kong and Shanghai. Tickets are sold via auto ticket selling machines which only accept COINS! 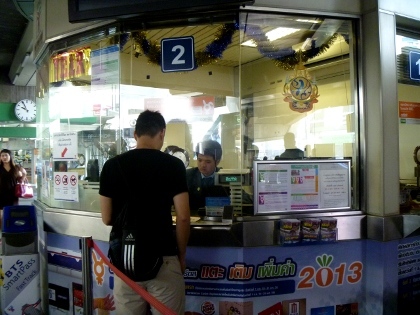 The ticket price varies from 15 baht to 40 baht depending on how far you are traveling to. Make sure you consciously hold on to some coins. If you don’t have enough coins, that’s no big deal. You can always exchange some with your bills at the ticket offices. Consult their English speaking staff if you have any questions. Skytrain was basically our main transportation method when we were in Bangkok. After one or two times of practice, we got relatively effective on ticket purchase. What we did was that whenever we were at a Skytrain station, Han would directly go to ticket office to exchange coins with 100 or 200 bill (doesn’t really matter because coins are very useful apparently) and I would check on the price on one of the machines at the same time when my mom stood in front of the entry gate. As soon as we got the tickets from the machine, we went to meet my mom and went in the station together. That’s like a good team work. 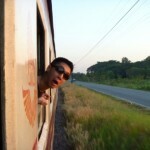 Anyways, at the beginning, I mentioned that it’s cheap to get around in Bangkok with public transit. It’s actually to compare to other transportation methods in Bangkok. The skytrain ticket price is still relatively more expensive than in other cities in Asia. There are two airports in Bangkok. The main airport Suvarnabhumi Airport (BKK) handles almost all international and domestic flights to Bangkok. 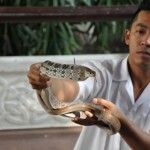 It’s located 30 kilometers to the east of Bangkok. Another one Don Muang Airport (DMK) located about 30 kilometers north of downtown. It was Bangkok’s main airport until 2006. Now it only handles some domestic flights. However, all the Air Asia flights leave from DMK instead of BKK starting from 2012. In this post, we will be talking about transportation of Suvarnabhumi Airport (BKK) only. Other than taking a taxi, the cost-effective way to get in downtown from BKK is to take the Airport Rail Line (the red line in the public transit map). The line runs from Suvarnabhumi Airport, via Makkasan Station, to Phaya Thai Station in central Bangkok. You can interchange BTS Skytrain at Makkasan Station. The ARL operates daily from 6:00 a.m. to 12 midnight, departing every 30 minutes. 90 baht for single way ticket and 150 baht for round way tickets. However, it seems that they will offer special promotions during holidays. 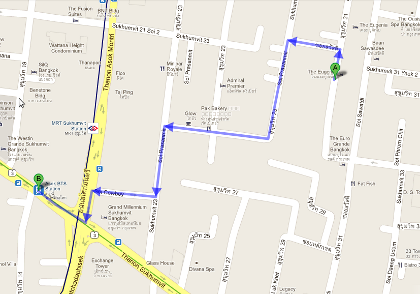 For example, during the last week of December 2012, from 11 am to 2 pm, one way ticket price was only 20 bath. It’s even cheaper than the Skytrain. If your flight departs or arrives at some weird time when taking ARL is not an option, please do not use the taxi service at BKK airport. The price given by the taxi service counter inside of the airport is way more expensive than a metered taxi. Let me give you an example. We arrived in Bangkok at 1 am on December 25th, 2012. The staff behind the taxi service counter directly input a number on a calculator without checking on any sort of document and showed me when I told her where we were going. That’s a little weird but maybe the staff was very familiar with the price and distance. The number was 1100 baht. I was on the fence until another guy asked about the price. The staff did the same thing. Didn’t check on anything and directly threw out a number on the calculator. It was 2800 from my peek at it. This made my decision of not using the service pretty easy! Just go out of the airport terminal and the taxi meter stand was right there. Tell the staff where you are going and they will write it down on a piece of paper and hand over to the taxi driver. 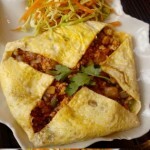 I usually show the hotel address on Agoda confirmation letter preloaded on my phone to them instead of saying as they will probably not be able to understand me sometimes since English is not my first language and not theirs either. The taxi rate turned out to be a little more than 500 baht. Take BTS Skytrain Silom Line to Saphan Taksin Station where the central boat pier Sathorn (Taksin) pier is. From there, you can easily access to the boat. There are different boat lines which can be indicated by the flag color on top of the boats. You want to take the boat with orange flag because it covers most of the major sights along the river and it’s reasonably fast too. You don’t need to buy tickets at the entrance of Sathorn pier. Usually, tickets are manually sold on the boat. There was this lady with a metal cylinder in her hand walking back and forth on the orange flag boat we took while asking passengers to buy tickets. Ticket price is 15 baht per person flat. However, not everyone on our boat bought the ticket though. No one really checked our tickets either when we got off the boat. The boats run every 5-20 minutes roughly from 06:00-19:00. To return from any main sight, wait for an orange flag boat at the same pier you get off. The boats go both directions at the same side of the river. Make sure you know where you are going and please pay attention to the stops when you are on the boat as no one’s going to tell you what next stop is…That’s why taking a look at the Chao Phraya Express Boat Map above on the left or even download it into your smart phone (that’s what I did) in advance is necessary. One thing we quickly learnt about Bangkok was the streets’ layout. Except for the main roads, there are lots of sois (in Thailand, small streets are called sois). The interesting part is that OFTEN roads and roads are not connected. In other words, there are many dead-ends. The direct distance from our hotel August Residence to BTS Skytrain Asok Station and MRT Sukhumvit Station looks pretty short on the map. I mean generally speaking, the location is pretty sweet. But it actually took us about 15-20 minutes walk to get to the public transit stations every time. Not too bad but something to keep in mind. Let me show you what I mean here. 7 turns before getting to the destination. Therefore, when booking a hotel in Bangkok, make sure to look closely at the map because the actual distance is very likely to be a lot longer than expected as you might need to make extra turns in order to avoid the dead-ends. So book your hotel smartly. That’s pretty much about it for now. If you think anyone will benefit from this post, please feel free to share it! Thank you! Talk to you soon!